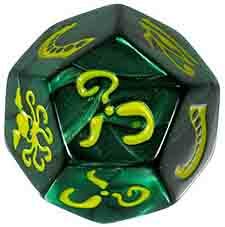 A custom 12-sided die, embossed with tentacles, Elder Signs, and more. Roll the die to destroy your opponents' sanity! Better yet, steal it. But watch out - when Cthulhu comes up, he takes sanity from everyone! 18 glass Sanity marbles are included. Lose all your marbles and you're mad. The last sane cultist wins... unless everyone goes mad together. Then Cthulhu wins! Keep Cthulhu Dice in your pocket and drive your friends mad wherever you go... over lunch, waiting for a plane... whatever the voices tell you to do.